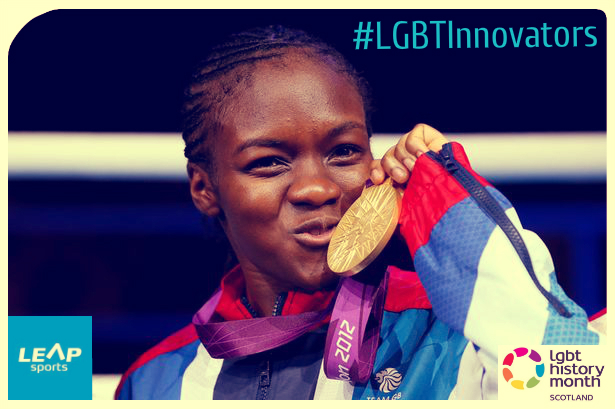 #LGBTInnovators - Boxer Nicola Adams | LEAP Sports Scotland LGBTI person to compete and win a gold medal in boxing at the 2012 Olympics. "> LGBTI person to compete and win a gold medal in boxing at the 2012 Olympics. Adams is rated world number two in the Flyweight boxing division. In 2007, she was the first English female to win a medal in a major tournament, taking Silver in the bantamweight (54kg) division at the European Championships in Denmark. She won Silver again at the world championships, China in 2008. In 2012, she also topped the Independent on Sunday’s Pink List of 100 Most Influential LGBT people in Britain. At the 2014 Commonwealth Games Adams beat Michaela Walsh of Northern Ireland to take the gold medal in the women’s flyweight. Written on 1st February 2016.